COOPERSTOWN, NY—In a series of baffling events during the summer of 1839, obsessive freak Abner Doubleday reportedly coerced locals into participating in a preposterous game that featured nonsensical elements such as "plates," "mounds," "bases," "balls," "bats," "gloves," "fair and foul territories," and the scoring of "runs" instead of points. "While those forced to take part in this strange diversion viewed Doubleday as a peculiar fellow, they were even more perplexed by the bizarre game itself," local observer William Moore noted in his journal, adding that many players simply walked off the field when Doubleday attempted to explain the tag-up rule and the balk. "Participants found it difficult to comprehend how a recreational activity could involve standing in one place for such extended periods of time. And this business about a 'strike' meaning you failed to hit the ball confused and angered many." 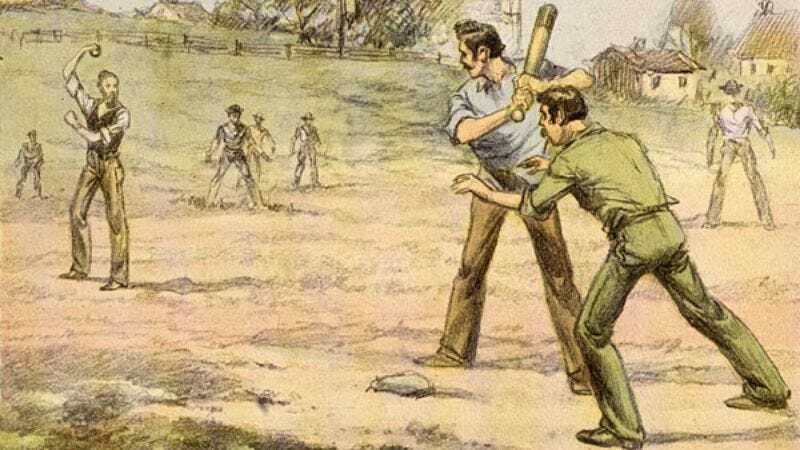 According to later entries in Moore's journal, participants finally began to enjoy playing the nonsensical game when, after weeks of frustration, they started using the long wooden sticks to tag out base runners.